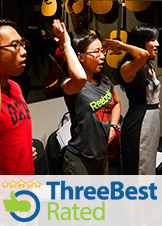 Enter into deeper devotion through gaining mastery over your voice instrument! Harness this unique gift of yours by understanding its workings and developing its power potential, flexibility and tonal quality. Move with more freedom in worship as you connect both your voice and your innermost convictions in song! Let your voice release your physical and spiritual being into total expression in our modules. Go beyond technique & mere melodies - as you develop ownership over your voice - to ministering powerfully the heartbeat of each song you sing. The Believer Voice Program™ is developed to help you express yourself beautifully with your voice or to complement your keyboard and guitar playing ability. If you dreamt of expressing yourself beautifully with your voice.... We'll take you there.